The holidays are a time of fancy lights, extravagant Christmas trees, and lots of festive decorations. 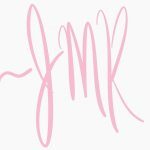 All your favorite Instagrammers have picture perfect homes decked out with Christmas decorations EVERYWHERE, and you just want to have a cute home without spending boo-koo bucks. Anyone with me?? 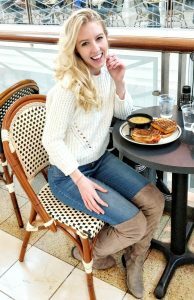 I feel ya – so do I. Luckily, I’ve found a few ways to do just that, and I’m sharing them with you here. So why not make your home or apartment fun and festive while saving that extra money to spend on gifts (or more decorations ;P). All Christmas decorations in this photo were $3 or less! Need an easy, inexpensive way to decorate your counters and other hard surface edges? You can make this festive light bulb garland for right around $5. I’m not sure if you can even find a garland less expensive than that at Walmart! It’s super simple to make, and will add that extra touch to make your home feel extra Christmas-y and fun. This is probably the simplest, most inexpensive way to decorate your place. And what’s so great about it is that you’re able to customize it to your exact liking! It doesn’t take much to make, and everything you’ll need is super affordable. I mean like $3 or less kind of affordable! You can make it as simple or as extravagant as you’d like, and as short or as long as you need. This is great for decorating places like counter edges, TV stands, mantles, and other other edges that could use a little pop of Christmas fun. 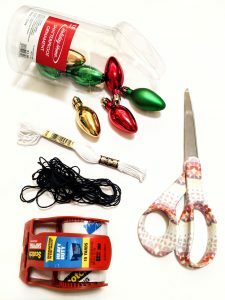 Below I’ve made a step-by-step guide for you to create your unique holiday garland. The number of ornaments needed will depend on the length of the piece you are attaching the garland to, and how spaced out you want them. 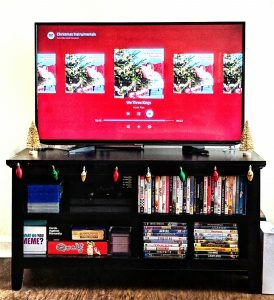 I made mine for a 43″ wide TV stand and I used 8 ornaments about 6″ apart. I got mine at Kroger, of all places, on sale for less than $2! One embroidery floss will be plenty. You can find them for about $0.47 in the craft section of Walmart, or at a craft store. I suggest going with a color that will blend into the surface you are attaching to or hanging from. Using the embroidery floss, measure the width of the surface you’re hanging the garland from. Add an extra 12″ to that measurement to allow 6″ on each end and then cut. Lay out your ornaments the way you want them to be on your garland. This makes it easier to visualize and keep them all in order so you don’t miss one or mess up your order. Starting at one end of the floss, tie on the first ornament about 8″ from the end. This allows length for attaching your garland to the surface or edge where you’ll be hanging it. Do not double knot/tie on the ornaments!! 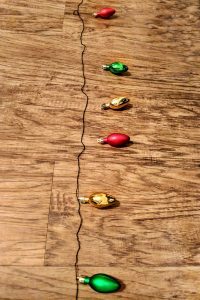 Using a single knot allows you to move and adjust the placement of the ornaments along the floss which will be very helpful when spacing them out. Continue tying each ornament onto the floss one by one, spacing them out as desired. If they are not equally spaced, you can hold one end of the floss and pull the ornament to move and adjust it. Once the garland is finished, attach to the desired surface using packing tape or push-pins. I used heavy duty packing tape to attach the extra length on the side of the TV stand. Okay, so I don’t know about you, but I’m a huge fan of the dollar store (hello, Dollar Tree)! It’s a great place to find holiday decorations for just $1 a piece. If it looks good, nobody needs to know it only cost you a dollar! I created this floral centerpiece entirely with pieces $3 or less. Keep reading to find out how. The size of your flower bouquet is totally up to you, but if you pair the right stems, you can get away with just 3 of them. To fill the vase, I used a couple light bulb ornaments to fill the empty space and hide the stems of the flowers. If you’re able to find flat glass stones to fill the vase, that would be even better, as you can see my stems are not fully hidden. 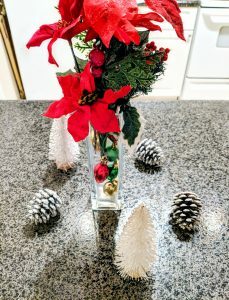 I also added a couple glitter trees and pinecone ornaments surrounding the vase to make it feel fuller and more joyful. When you open up and pull out the felt banner, make sure you separate and space out the letters so they’re not overlapping or cramped. Start by hanging up the tinsel sleigh, making sure to leave room above and below for the banners. Once you’ve got the sleigh positioned, hang the “Merry” banner above, making sure it is centered above. The “CHRISTMAS” will be much wider than the “Merry” which is why it is important to center it in relation to the sleigh. To hang up my banners I used heavy duty packing tape and folded the ends of the banner under the tape. 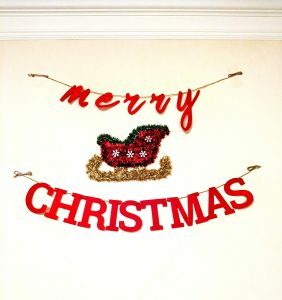 Once you have the “Merry” banner up, hang the “CHRISTMAS” banner underneath, using the sleigh as the central point to center. You may need to adjust the letters or placement of the banner to get it right. I had to move mine about 5 times! Don’t worry. You got this! And Voila! festive wall complete. If I had to choose a favorite Christmas decoration, it would probably be all the lights. I love the way they light up the room (or outdoors) and add warmth and cheer to the environment. It’s also a very affordable way to decorate for the holidays! A box of 100 count lights costs less than $3 a box if you get the simple white or colored lights. You can choose the green or white cord, but I prefer white so it blends in more and can be used year-round. Decorate your windows for just $5! The more decorative style of lights will be more expensive. So if you want pointy bulb shapes, or mini round bulbs, they’ll likely run you about $8-15 a box. And if you prefer name brand or energy efficient lights, those will also be a bit more per box. If you can afford to splurge, Walmart has a box of red, green, and white mini round bulbs that would be an adorable and extra fun option for Christmas. They’re about $12 a box. But no matter what your budget, you can still light up your room (and your mood!) and bring that bright, holiday cheer to any space. For these two windows I used 2 boxes of 100 count lights which was ALMOST perfect. Just needed 3 more lights ;P. If you want to be specific, measure your window before buying your lights so you know how many to get. 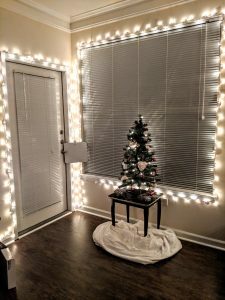 Make sure the cord is long enough to plug in, and simply hang the lights with clear push-pins (pin in-between the wires) or clear packing tape. To get these exact lights that I used, find the red box of Holiday Time “100 Clear Mini Lights” in the Christmas Shop in Walmart. So whether you’re trying to be a money-savvy decorating diva, or you’re a budget-less babe, I’m hoping these simple tips have inspired some creativity and added a little extra happiness to your holidays!